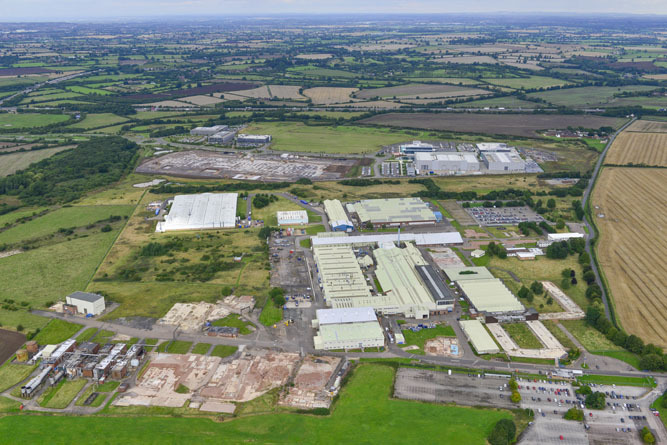 Manse and Opus Land, two leading property development companies have been successfully appointed by the manufacturing giant Rolls-Royce to lead the promotion and regeneration of the surplus areas of their site at Ansty, near Coventry. The total Gross Development Value of the project is likely to be in the excess of £250m and will deliver more than 2,000,000 sq. ft. of industrial manufacturing and office accommodation. It is intended to complement and extend the success of Ansty Park, by providing land and buildings for the manufacturing community. The subject site comprises 200 acres of land located immediately to the south of Ansty Park. It has always been used for manufacturing and indeed it was the site which helped with the development of the UK’s first rocket, Blue Streak and where the rocket engines for the only British launched satellite in 1971, Prospero were manufactured. Latterly it has been a fast jet repair centre providing support for fighter aircraft for customers throughout the world. Ansty Park is a 1,500,000 sq ft technology park which benefits from a dedicated dual carriageway connecting it to Junction 2 of the M6 and the M69 and A46, making a massive 82% of the UK’s population within a 150mile drive. The park is anchored by MTC (Manufacturing Technology Centre) which represents a £40.5 million publicly funded investment, developed in response to the Government's manufacturing strategy which sets out an ambitious new vision for high technology manufacturing. A unique collaboration between the Universities of Birmingham, Loughborough University, the University of Nottingham and TWI Ltd exists. In addition, The MTC now have more than 65 industrial members including Rolls-Royce, Aero Engine Controls, Airbus, GKN Aerospace, Hewlet Packard, Nikon, Sandvic & Siemens. Other occupiers include Sainsbury’s Head Office and Call Centre, AVL Electronics, Fanuc and London Taxi Company for the manufacture of the new electrically powered taxi. Manse LLP who has formed a long term strategic relationship with Rolls-Royce through the regeneration of its former works at East Kilbride and has joined forces with Opus Land, its sister company through their mutual partnership with Palmer Capital, to deliver this project. Rolls-Royce will be retaining a key manufacturing facility on the site, producing fan cases for its large civil aero engines. “This site represents a unique opportunity to bring economic benefits of a significant scale to the region and is set to become one of the most important redevelopment sites in the Midlands. The site is one of the most viable and deliverable development opportunities in the region and builds on the success of neighbouring Ansty Park already home to the hugely successful Manufacturing Technology Centre (MTC) http://www.the-mtc.org, Fanuc, London Taxi Company and Sainsbury’s. Major occupiers based within a short distance of the site include Jaguar Land Rover, UK Mail and Network Rail. JLL and Knight Frank are the marketing agents for Prospero, Ansty.